With this standing aid you can get up from your couch to check on dinner and be back before the commercials end. Proper support makes standing and sitting that much more comfortable. Forsite Health’s EZ Stand Chair functions like a grab bar or handrail when positioned in front of your chair, couch, or bed. You simply grab onto the comfortable foam grips, at whichever of the three heights works for you, and ease yourself up or down with the security of the stander’s steel frame and wide base. 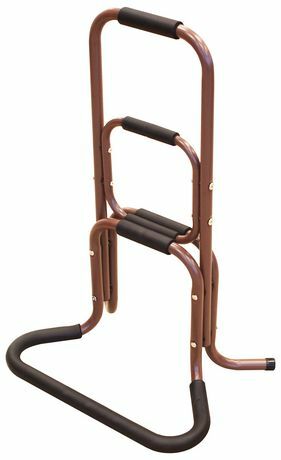 • The standing aid measures 32 inches high, 20 inches wide and 15 ¾ inches deep when assembled. • Yet, it tucks away beneath your furniture when you don’t need it, for maximum convenience. • Those with arthritis or soreness in their hands will appreciate that this chair support is assembled only with allen keys—there’s no need for hard-to-turn screwdrivers or heavy pliers.